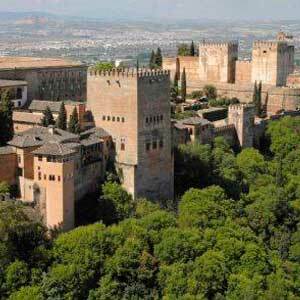 Join a Group and visit the Alhambra including Tickets, Guide and return transport from Seville. Departing from Seville we will pass Washington Irving's famous route in direction to Granada. 2 in 1: Discover the fascinating city of Granada and visit the most important monument of Spain in one day! With this full-day excursion you will discover the cultural and monumental essence of eastern Andalusia. The UNESCO World Heritage-listed Alhambra and Generalife complex is one of the most beautiful workings realised during the Middle Ages in the Iberian Peninsula. The monument is historically and culturally conected with Granada city. Last resort of the Catholic Kings, Granada stands out with its rich historic, cultural and natural heritage. The tour includes the tickets for all parts of the Alhambra complex, the official guide who will accompany you during the whole morning and the return transport to Seville city centre (by bus or by train depending on operational availability). After visiting the Alhambra the bus will bring you down to the historic city centre where you will have time to make some shoppings and have lunch. Later in the afternoon we return to Seville. * 06.15 - 06.45 AM: pick-up from your hotel in Seville. * 07.00 AM: start of journey by train or bus (depending on operational availability) to Granada. 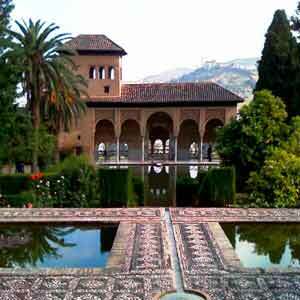 * 10.00 AM: pick-up from Granada train station in transfer to the Alhambra (train option). * 10.30 AM: start of the guided Alhambra tour. * 01.30 PM: lunch menu (Andalusian cuisine) 16 € p.p. * 04.00 PM: return to train station (train option). * 05.00 PM: start of journey by train or bus (depending on operational availability) to Seville. 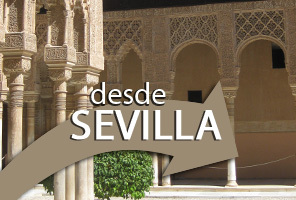 * 08.00 PM: pick-up from Seville train station and transfer to your hotel (train option). We will pick you up from your hotel in Seville city centre between 6.15 and 6.45 AM. In case you are not lodged in a hotel in Seville city centre, we will provide you with an alternative pick-up point after the completed booking process. Saldremos desde Sevilla a Granada siguiendo la ruta que hiciera el escritor Washington Irving. Pasaremos junto a ciudades mencionadas en Los Cuentos de la Alhambra como Alcalá de Guadaira, Arahal, Osuna, Santa Fé, atravesando campos de olivos, cereales y frutales y, sobre todo, las montañas y valles donde el viajero imaginara a los bandoleros y contrabandistas de las serranías andaluzas, en una visión romántica de España. Te recogeremos de tu hotel a la hora indicada abajo. Podrás disfrutar de un breve recorrido panorámico por Sevilla antes de inicar el viaje a Granada. The tickets provide you with access to all parts of the Alhambra and Generalife complex. You will get the tickets from our tour guide before the tour start. The official guide will accompany you during the whole morning and explain in full detail the history and architecture of the areas mentioned before. Your booking will automatically enter into our system, thus your confirmation is not required. However, in case you did not tell us about your hotel for the pick-up location we kindly ask you to do so the day before your starts between 10am and 1pm / 17pm and 19pm, calling at (+34) 664 274 428 o +34 954 211 609.